But the facial features of the creature… At this point, I have to take a deep breath, realizing I still feel sick. In the skull, where you would expect to see a normal hare’s nose, eyes and large front teeth, I saw a human child’s blue eyes, snub nose and small toothless mouth. Professor Jean Moltique, the leader of the expedition, is delighted by the find, suspecting a missing link in human development, and instructs his assistant to find out more about the small creatures who hover around the entrance to a large network of caves. 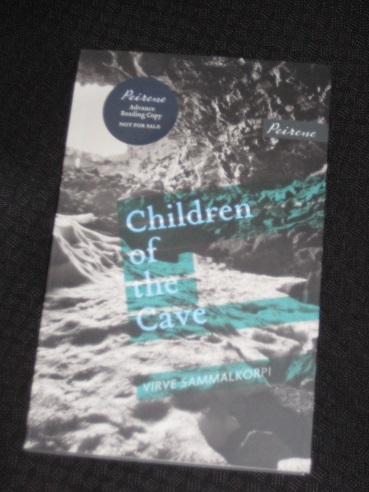 Children of the Cave is a short, fascinating work written in a pseudo-documentary style. The author features here as a compiler of documents, organising the remaining fragments of Iax’s diaries and commenting (academically, of course) on events while drily speculating on missing entries. What comes together from these fragments is a record of an expedition that, having started optimistically, is to end very badly. In fact, there’s more than a suggestion (on several occasions) that the records may have been deliberately ‘mislaid’. Iax to get close enough to document the children’s physical features (and perhaps a little too close). What he sees requires him to adjust his beliefs to encompass the new situation, enough to engender a mini crisis of faith. The irony is that this doesn’t just refer to the children. Surrounded as he is by a bunch of merciless scoundrels hundreds of miles from civilisation, Iax realises that he must be very careful not to get on the wrong side of his ‘helpers’. Sammalkorpi’s novel makes for yet another intriguing addition to the Peirene collection, and the mother/daughter translation team of Emily and Fleur Jeremiah have done more good work on their fourth Peirene book. Besides the obvious echoes of Mr. Darwin’s Gardener, the format also reminded me of Richarda Huch’s The Last Summer, both for its diary form and for the uncertainty arising from only hearing part of the story. It’s all nicely done, and the writer has managed to show the changes in Iax’s mood as the expedition progresses, with his initial enthusiasm and fascination with the children gradually giving way to panic as he falls apart under the stress of the experience. I liked the way this was constructed and thought it mimicked the tone of 19th century exploration perfectly, though I, too, would have been interested in more of the children. It’s one I’d be happy to see on the IMBP list, but not shocked to see missing.